The information in this section has been compiled from various sources to help anyone who is not from our wonderful province learn a bit about it. Have a browse down through some of the highlights and enjoy!! Planning a trip to da Rock? If so, read our�Travel to da Rock�section for some time and money saving tips. The province lies between the 46th and 61st parallels with the bulk of the island portion being below the 50th parallel. The island is located in the Gulf of St. Lawrence and the larger Labrador portion is on the eastern part of the Canadian mainland. 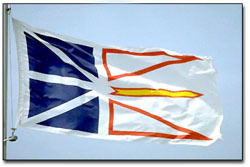 Newfoundland and Labrador is Canada's most easterly province and its newest having joined Confederation in 1949. Newfoundland and Labrador would rank fourth in size behind Alaska, Texas and California...if it were one of the United States. It is almost one and three quarters times the size of Great Britain. Aboriginal people first discovered Newfoundland thousands of years ago, but in their present day oral tradition there is no individual associated with their discovery of Newfoundland. The first known European individual associated with the discovery of Newfoundland is the Viking Leif Eiriksson who landed at L'Anse aux Meadows, near St. Anthony on the northern tip of Newfoundland, in the summer of 1000 or 1001 AD. We know this because his discovery is written down in trustworthy sagas that are preserved in European museums, and Viking ruins were found in 1960 at L'Anse aux Meadows where the sagas intimated they would be found. The island of Newfoundland enjoys winters that are surprisingly mild by Canadian standards, between 0�C and -5�C., though with a high rate of precipitation. The average temperature in Newfoundland in the summer is between 10�C and 20�C. Labrador, by comparison, has cold winters, between 10�C and -25�C, and brief summers with temperatures between 5�C and 15�C. Newfoundland's climate can best be described as moderate and maritime. 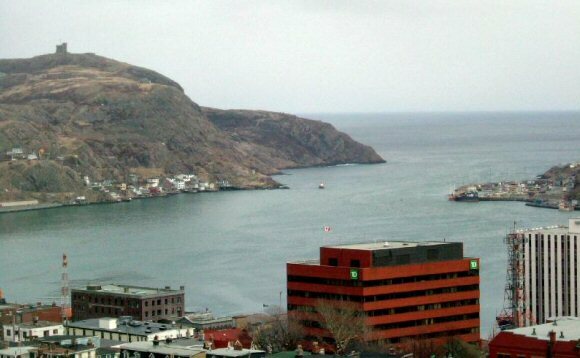 St. John's is the capital of Newfoundland and Labrador. The City's population is 99,182, while the metro area population is about 172,918. The population of Labrador is 27,864. The population of the whole province is 509,677 (and falling). In this flag, the primary colours of red, gold and blue are placed against a background of white to allow the design to stand out clearly. Gold our confidence in ourselves. The Blue section, most reminiscent of the Union Jack, represents our Commonwealth heritage which has so decisively shaped our present. The Red section and Gold section, larger than the others, represent our future. The two triangles outlined in the picture portray the mainland and island parts of our province reaching forward together. A golden arrow points the way to what we believe will be a bright future. But the design of the flag encompasses much more symbolism, for example, the Christian Cross, the Beothuck and Naskapi ornamentation, the outline of the maple leaf in the centre of the flag, a triumphant figure and our place in the space age. The image of the trident stands out. This is to emphasize our continued dependence on the fishery and the resources of the sea. Hung as a banner, the arrow assumes the aspect of a sword which is to remind us of the sacrifice of our War Veterans. Since the whole flag resembles a Beothuck pendant as well as all of the above, the design takes us from our earliest beginnings and points us confidently forward. It therefore, mirrors our past, present and future. The flag was officially adopted on June 6, 1980. 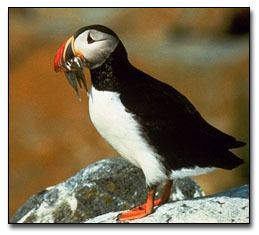 The Atlantic Puffin is the provincial bird. About 95% of all North America's puffins breed around the Newfoundland and Labrador coasts. 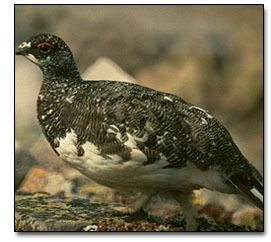 The partridge (Lagopus sp) or ptarmigan is the provincial game bird. Two partridge species, Willow Ptarmigan and the Rock Ptarmigan, are found throughout the province. Found primarily in barrens and high country, the partridge epitomizes the open wilderness. It is an arctic bird, and it is speculated that the Burin and Avalon peninsulas may be the most southern, naturally occurring extremity for the bird's range in North America. More than 100 years ago, Queen Victoria chose the pitcher plant to be engraved on a newly minted Newfoundland penny. In 1954 the Newfoundland Cabinet designated this interesting plant as the official flower of the province. 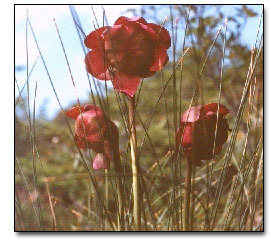 The pitcher plant gets its nourishment from insects that are trapped and drown in a pool of water at the base of its tubular leaves. These plants, with their wine and green flowers, are found on bogs and marshes around the province. The cross is based upon the cross of St. George, but of a different colour. The lions and unicorns are based upon those in the Arms of England, to which the unicorn had been added at the time of the union of England with Scotland. The shield is surmounted by an elk and supported on either side by what the Grant of Arms describes as "Savages of the clyme - armed and appareled according to their guise when they go to war...," apparently representing the now extinct Beothuk Indians of Newfoundland. The translation of the motto is "Seek ye first the Kingdom of God." Newfoundland Standard time is 30 min. ahead of Atlantic Standard Time (in effect in the Maritime provinces) and 1 � hours ahead of Eastern Standard Time (in effect in New York and Toronto).It's the only place in Canada with a split in the set variations of one hour between time zones. The Labrador portion of the province operates on Atlantic Standard Time (� hour behind Newfoundland), except for the area on the coast from L'Anse au Clair to Cartwright which operates on Newfoundland Standard Time..... just to really complicate things. Many people wonder why the Province of Newfoundland has a time zone that varies by the half hour rather than the standard one hour. Newfoundland lies squarely in the eastern half of its time zone, exactly three and a half hours from Greenwich. While the system of Standard Time employs 24 meridians, and each are theoretically the centres of 24 Standard Time zones, some adjustments have been made to the time zones for the convenience of inhabitants that lie within the zones. For Newfoundland, it was convenient to have the least amount of time difference between the island and the mainland. Daylight Saving Time is observed from March to November after which the province returns to Newfoundland Standard Time. The Newfoundland government attempted to bring the province into conformity with the other Atlantic provinces in 1963, but withdrew in the face of stiff public opposition. Other countries that operate on the half hour time difference are: Suriname, Iran, India, Sri Lanka, and Central Australia. Cartwright is NOT on Nfld time. Cartwright and Black Tickle are both on Atlantic time. They are the only communities on the South Coast of Labrador that are. 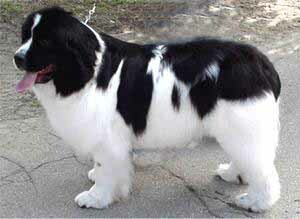 The Newfoundland is a large dog with the size and strength to perform the tasks required of him. He has a heavy coat to protect him from the long winters and the icy waters surrounding his native island. His feet are large, strong, and webbed so that he may travel easily over marshes and shores. Essentially the Newfoundland dog is as much at home in the water as on dry land. Canine literature gives us stories of brave Newfoundlands which have rescued men and women from watery graves; stories of shipwrecks made less terrible by dogs which carried life lines to stricken vessels; of children who have fallen into deep water and have been brought safely ashore by Newfoundlands; and of dogs whose work was less spectacular but equally valuable as they helped their fishermen owners with their heavy nets and performed other tasks necessary to their occupations. Although he is a superior water dog, the Newfoundland has been used and still is used in Newfoundland and Labrador as a true working dog, dragging carts, or more often carrying burdens as a pack horse. In order to perform these duties the Newfoundland must be a large dog - large enough to bring ashore a drowning man. He must have powerful hindquarters and a lung capacity which enables him to swim for great distances. He must have the heavy coat which protects him from the icy waters. In short, he must be strong, muscular, and sound so that he may do the work for which he has become justly famous. Above all things, the Newfoundland must have intelligence, the loyalty and the sweetness which are his best known traits. He must be able and willing to help his master perform his necessary tasks at command and also have the intelligence to act on his own responsibility when his rescue work demands it. The Newfoundland dog is mainly kept, not as an active worker, but as a companion, guard and friend. We appreciate particularly the sterling traits of the true Newfoundland disposition. Here we have the great size and strength which makes him an effective guard and watchdog combined with the gentleness which makes him a safe companion. For generations he has been the traditional children's protector and playmate. Near this spot are deposited the remains of one who possessed Beauty without Vanity, Strength without Insolence, Courage without Ferocity and all the Virtues of Man without his Vices. And so ends our quick lesson about Newfoundland and Labrador, AKA "God's Land". We say that because it is well known that God spent half an hour more creating Newfoundland. Do you have more to add? If so, drop me a line.